Human trafficking happens around the world -- and right down the street. A Washington, D.C. organization works to save girls from dangers close to home. The ArchAndroid, by Janelle Monáe, Atlantic Records. I have been fighting tears for the past few days. And as Tuesday draws closer it becomes harder and harder to keep those tears at bay. 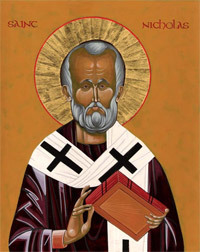 As you all encounter pictures of "jolly, old St. Nick" this season, remember that St. Nicholas the Wonderworker was a real Christian hero. He spent his life working for freedom and justice for the poor and powerless. In particular, he is known for saving three women from being sold into prostitution and preventing the execution of three men who were wrongfully convicted.